I am firmly of the belief that cinnamon is an anytime-of-the-year spice. But fall and winter, truly, is where it shines. Cinnamon warms you from the inside out. The scent alone feels like a cozy night in front of a fireplace — it’s the culinary equivalent of a firm hug. Last year, with temperatures hovering in the 60s and 70s here in NYC, it hardly seemed necessary. But in 2016, December feels like December, it’s cold and windy and cloudy, and along with all the cheese I want to put on everything, and all the chocolate I want to consume, I want to add cinnamon to every single thing I touch. These cinnamon apple oatmeal scones hit that craving perfectly. 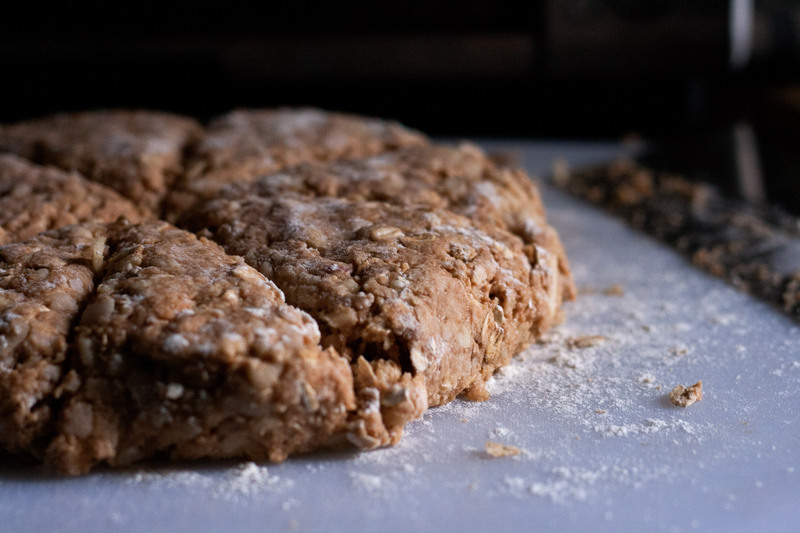 While I’m still a sucker for Sunday pancakes or French toast or even bread pudding, I love pulling warm scones out of the oven. Schmeared with rich butter and paired with a side of eggs and maybe a strip or two of bacon, it sort of makes me feel like I’m at a bed & breakfast — even though I’m the one doing the cooking. There’s just something satisfying about grating apples, about pulling dough together with my hands — the feeling of it yielding beneath my floured fingertips as I pat it down into a round, cut it into triangles, gently pull them apart and place them on a baking sheet, showering them with a flurry of crunchy turbinado sugar. 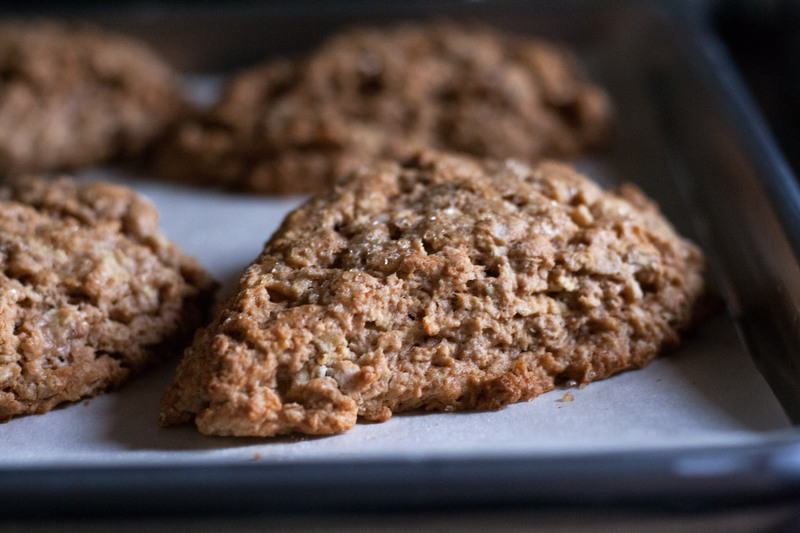 And these cinnamon apple oatmeal scones are incredibly satisfying to eat, too. 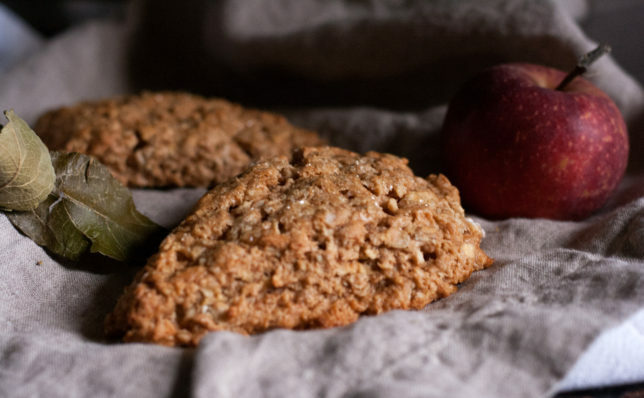 The grated apples melt into the dough, giving them a lovely, tender texture that’s juxtaposed with the nubby, softened oats and the crunchy, turbinado topping, making them delightfully craggy. And the bright flavor of the apples, magnified by the boiled cider if you have it or choose to make it, is wonderfully highlighted by a hearty dose of that warm, spicy cinnamon. The wind is howling and the snow and ice and bitter cold are taunting us. I’m really okay with that — it feels like it’s the way it’s supposed to be. 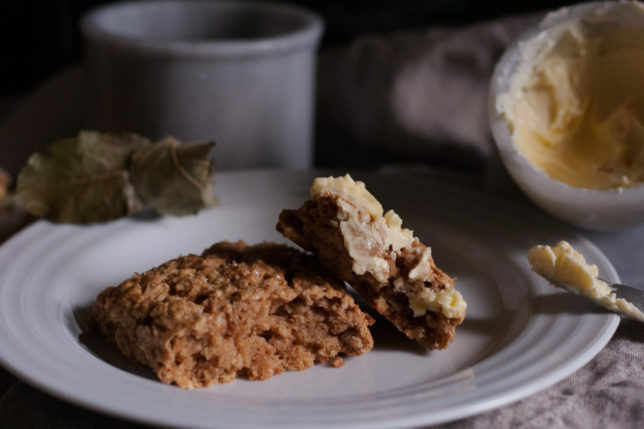 Won’t you join me inside for some warm cinnamon apple oatmeal scones and a cup of tea? The boiled cider is totally optional here, but gives a punch of concentrated apple flavor. You can buy it from King Arthur Flour, or make your own: Pour 1 cup of cider and bring to a simmer over medium heat, stirring occasionally. Simmer until the cider is reduced to ¼ cup, about 20 minutes. It should have thickened and should coat the back of a spoon. You’ll only need one tablespoon here, so reserve the rest for another use. In a large bowl, whisk together the flour, oats, baking powder, salt, and cinnamon, and sugar. Cut the butter, in pats, into the flour mixture and work it in with a pastry blender or your fingers until it resembles coarse crumbs. Add the grated apple and toss with a fork until combined. Add ¼ cup milk and boiled cider, if using, and gently stir until it begins to come together. The apples will release quite a bit of juice, so wait a moment, check the dough, and if it’s still floury add more milk a tablespoon at a time. The dough will be quite sticky. On a well-floured counter, knead the dough lightly with well-floured hands, adding more flour if necessary if it’s too sticky to work with. This is a very forgiving dough, so don’t worry that it’s too wet or you’ve added too much flour, just make sure you can work with it. 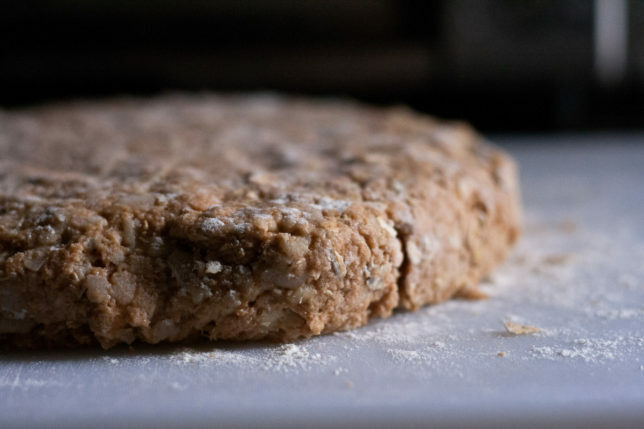 Form the dough into a round about 1 inch thick. With a sharp knife or bench scraper, cut the dough into 8 triangles. Use a bench scraper or a spatula to help you remove each section to your baking sheet. Brush the top of each scone with milk and sprinkle with coarse sugar. Bake for 25 minutes or until the scones are golden brown in color. Remove to a wire rack to cool completely. Scones keep well in an airtight container for three days. After the first day, they come back to life beautifully after 10 minutes in a 300-degree oven.